Adopted on 2011-11-24. Implementation completed. This is a proposal to add the ability to render vector field layers in MapServer. 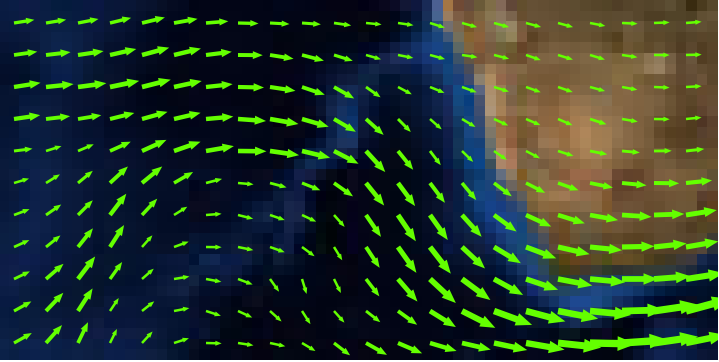 Vector fields are used for instance in meteorology to store/display wind direction and magnitude. This RFC proposes the addition of a new type of layer in MapServer: CONNECTIONTYPE UVRASTER. The new type is a hybrid layer, which has a raster data source as input and vector features as output. Initially, only the point representation of those vector features will be supported. Also, queries won’t be supported in this phase. Since the data source is a raster, all raster processing options can be used (e.g. RESAMPLE). After a few tests, we determined that the best results (for all different zoom levels) for vector fields were when using RESAMPLE=AVERAGE and this will be set by default for UV layers unless another type of resampling is explicitly specified in the layer definition. Set the layer TYPE to POINT. Set the DATA to the raster file that contains u/v bands. Specify the 2 bands to use as u and v.
Specify a class to render the point features. UV_SPACING: The spacing is simply the distance, in pixels, between arrows to be displayed in the vector field. Default is 32. UV_SIZE_SCALE: The uv size scale is used to convert the vector lengths (magnitude) of the raster to pixels for a better rendering. Default is 1. Internally, a UVRASTER layer will have its own renderer/driver code. It’s a hybrid layer because it reads the raster source as a normal raster layer does, but all other functions behave like a vector layer. The layer can be drawn as a normal point layer using whichShape, GetShape etc. whichShape() is called: the raster data source is read using the internal GDAL functions, resample and all other raster options are applied and the u,v pixels result is stored in the internal layer structure. getShape() is called: loop through the raster pixels and returns a shapeObj (Point) created with the pixel location. MapServer draws its point feature as any other vector layer. No issue for any MapScript bindings. The UVRASTER layer is handled/rendered internally as any other layer..
+1 from Jeff, Olivier, Assefa, Perry, FrankW, Daniel, Stephen, Michael, Thomas, Tom and Steve.